Venezuela’s leading opposition figure Maria Corina Machado is to be investigated over an alleged plot to assassinate President Nicolas Maduro. 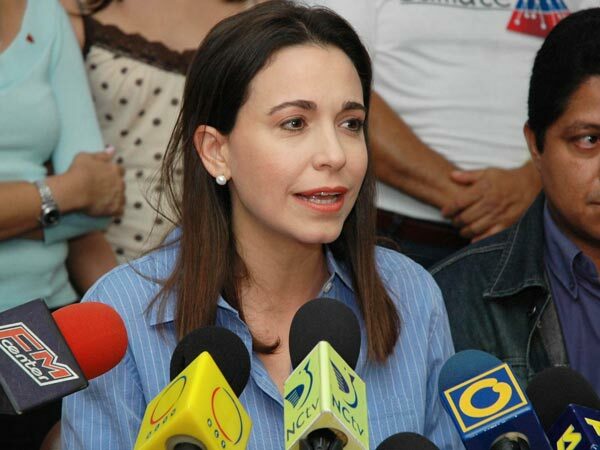 Maria Corina Machado, a former congresswoman, led a major street protest against President Nicolas Maduro’s government in January. She dismissed the accusations as a charade designed to silence her. The alleged plot came in a series of emails which Maria Corina Machado says are fake. She said the charges were designed to distract Venezuelans from a growing economic crisis. Officials produced the emails in the midst of months of street protests. They said they contained conversations between Maria Machado and US State Department officials discussing a plot to overthrow the Venezuelan government. Maria Machado said the messages used her old email accounts and had been manipulated and were fabricated. She said on her social media account that the conspiracy charges were in retribution for demanding a new leadership at the state elections council. Maria Machado had helped lead demonstrations which had initially been started in January in the western state of Tachira by university students. They were protesting against the high rate of crime on campuses and the country’s struggling economy. She was expelled from the National Assembly in March after she backed the protests which had spread across the country. The President of the National Assembly, Diosdado Cabello said Maria Machado had been expelled because she had incited violent protests in which over forty protesters and police officers died. She said she would continue to support all types of protests in the country against what she described as “daily abuses committed by the government”. Since narrowly winning an election last year to succeed his mentor, the late President Hugo Chavez, Nicolas Maduro has said there have been five assassination attempts against him and more than a dozen acts of sabotage and conspiracy. Conspiracy carries a prison sentence of between eight and 16 years in Venezuela.